Some would argue that vision is our most critical sense. It is the window through which we perceive the world. It is due to the vision that you can read this article at this very moment. For all of these reasons, it is important that you take good care of your eyes, this will allow you to ensure that your vision remains clear for a long time. While it is easy for us to care for our eyes, as we have opposable thumbs and many products at our disposal, this is not the case for our four-legged friends. Unfortunately for dogs, clawed paws make it difficult to accomplish the delicate motions which are required to deal with eye irritation and other situations which involve the eyes. It is for this reason that our dogs are reliant on us to care for their eyes, as with many other aspects of their grooming and personal care. Over the course of this article, we will provide several reasons why you should care for your dog's eyes, and we will give you the means to do so. We have already discussed how dogs are incapable of maintaining their eye health, but there are more crucial reasons why you should keep your dog's eyes healthy. Dog eye problems can result in a whole host of issues further down the line that can be avoided by putting a bit of effort into your dog's eye care. Since dogs do not care whether an area is dirty or clean, they will tend to play anywhere. These conditions are not ideal for good ocular health, so it is important to keep an eye out for reddening of the eyes or any other symptoms which may show that your dog is having issues regarding ocular health. The most obvious reason that you should care for your dog’s eyes is to avoid any potential eye damage that can result in either partial or complete blindness. In addition to the fear and suffering that this can cause your pet, it can also incur heavy medical bills for treatment and surgery from vets. Dog eye infections can result in much more serious conditions than blindness, however. As with any other kind of infection, an eye infection can spread with relative ease. Unfortunately, if the infection manages to spread through the optic nerve, the infection may reach your pet’s brain in which it may cause irreparable damage and even death. Infections are not to be taken lightly, and they tend to result from a lack of care for the infected body part. This is one of the main reasons that you should put a good deal of effort into caring for your dog’s eyes. An infection, if caught early enough, can be relatively harmless. If you leave the infection to fester, on the other hand, no amount of treatment will help. One of the easier ways to make sure that your dog’s eyes remain healthy for a good deal of time is to get fur out of their eyes whenever you can. This is especially important for dogs with long and coarse fur, as they will be the ones with fur in their eyes the most often. This includes such breeds as Irish Wolfhounds and Saint-Bernards. The reason that you will want to keep hair out of your dog's eyes is that it will tend to scratch their cornea, which is the surface of the eye. A scratched cornea can result in anything from blurred vision to permanent blindness, so it is more important than it may seem to keep your dog's eyes clear of any fur. 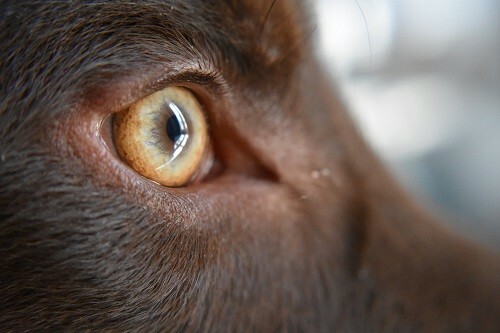 If you notice cloudy eyes in dogs or if you notice any dog’s eye’s red, it is important to take immediate action. 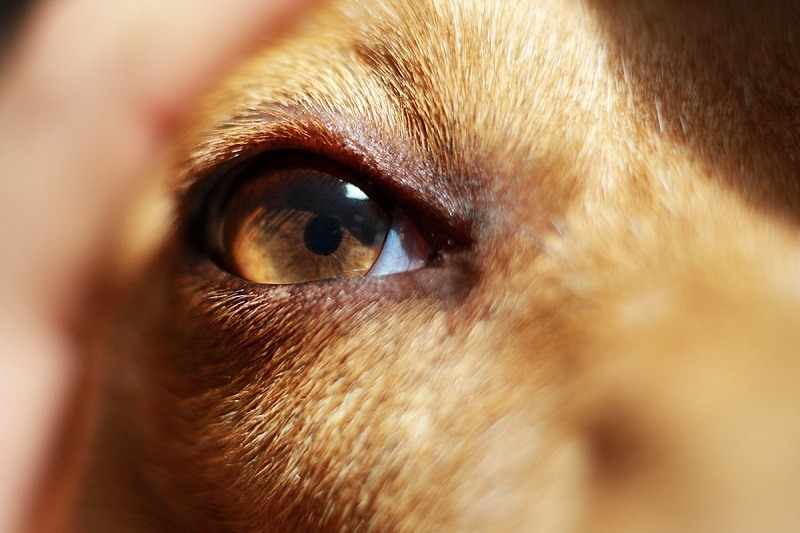 The eyes are one of the more sensitive parts of our bodies, which is true for both people and dogs. The relative fragility of eyes means that the sooner you diagnose an issue, the less of a chance that it will result in permanent damage. Do not hesitate to bring your dog to the vet for a checkup if you happen to notice any issues in regards to its eyes. The most likely outcome is that your dog has a minor eye infection which will necessitate eye drops over the course of the coming weeks. If you fail to act quickly enough, you may find that a minor problem has progressed into a more major one, so it helps immensely to be hasty. In the event of certain conditions, your dog may require eye drops. Applying dog eye drops may be somewhat more difficult when compared to applying eye drops to your own eyes, but it is by no means impossible. The first step is to ensure that you hold your dog’s head steady. 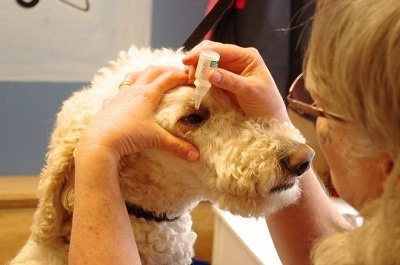 You will want to try and apply the eye drop without your dog blinking, so it helps to drop it in by surprise. You may or may not need to hold your dog’s eye open depending on how cooperative it decides to be. This is all that is required to properly apply eye drops to your dog's eyes. While it may require a few attempts to get it right, it should eventually work out. Keep in mind that certain types of eye drops can get expensive, so applying them efficiently may end up saving you money. Caring for your dog’s eyes is not a hard process. It may require a little bit of effort, but your dog will most certainly thank you for it. We hope that this article has proved educational for all of you pet owners out there.